Wylie's heart was broken. Her heart was "incompatible with human life." (If I never hear that term again, it would be too soon.) I knew I wanted to incorporate a human heart into her memorial tattoo and I knew I wanted it to be a whole heart, one that didn't have to be broken anymore. 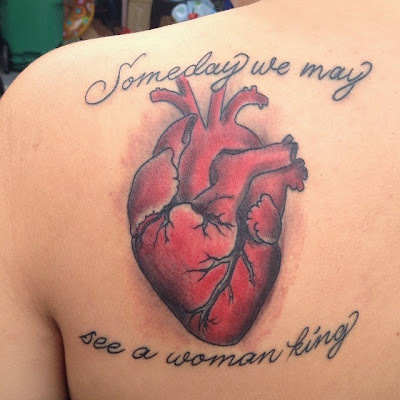 I wanted the lyrics to her song, Woman King by Iron and Wine, to be there, too. I showed the tattoo studio a few different sketches and what was waiting for me was more beautiful than I could have ever imagined. Of course, big thanks to Ted Mendoza at No Hard Feelings in Coral Springs for Wylie's beautiful memorial tattoo. It's nice to have this piece of her with me always, a piece of her that is no longer broken or suffering. This is a beautiful way to remember Wylie and keep her near you.